Students from across the UC system travel to the UC Board of Regents meeting at UCSF Mission Bay in November to protest a potential rise in tuition after a two-year freeze ends at the start of the 2017-18 school year. The university announced its proposal of a $282 tuition hike Wednesday. 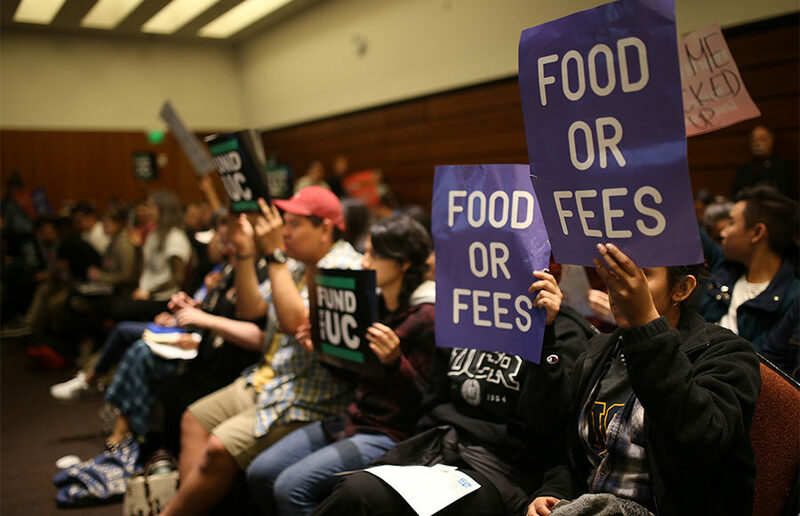 Outside the UC Board of Regents’ second day of meetings at UCSF Mission Bay on Thursday, students from across the UC system railed against potential tuition hikes in protest and during public comment. While more than 50 students protested tuition hikes outside the conference center where the meetings were held, Regent Hadi Makarechian presented a report by the Finance and Capital Strategies Committee explaining that further consideration of tuition hikes would occur in January. Students anticipate tuition will increase after a two-year tuition freeze is set to expire at the start of the 2017-18 school year. 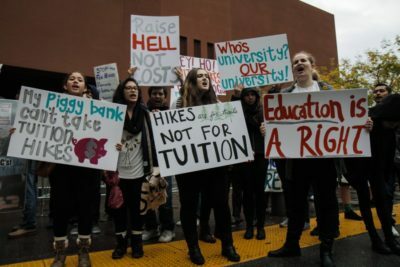 Students were gathered in front of the conference center and marching around the driveway calling on the regents not only to freeze tuition but to roll back existing fees, according to Fund the UC Director Lucy An, who works in the Office of the ASUC External Affairs Vice President. On the first day of meetings, the UC Chief Financial Officer Nathan Brostrom pointed out a $23 billion gap between UC funding with current state and tuition levels and the operational budget. Brostrom proposed a $300 or less tuition increase in light of last year’s approved enrollment growth. 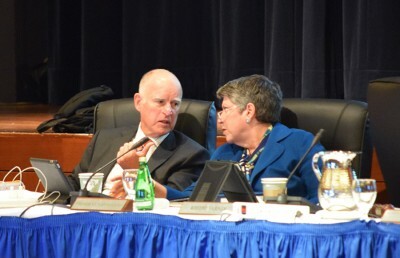 Additionally, the committee discussed increasing on-campus housing at UC campuses and UC employee retirement funding. Members of the crowd, which was largely made up of the California Nurses Association, cheered and snapped in reaction to Washington Jr.’s statement. Nurses who were at public comment for a different matter held hands and circled the students outside briefly in agreement with their protest. Students bussed in from UC Berkeley, but dozens of others came from as far as UC Riverside and UC San Diego. ASUC Interim UC Riverside Vice President of External Affairs Oscar Loera said many of them drove for upward of nine hours overnight to get to the meeting to show solidarity within the UC system. Students moved into the meeting room after 10:30 a.m. in time to hear the regents discuss how to use financial aid to maintain access and affordability for undergraduate students. Protesters spoke over regents numerous times in the ensuing discussion. Vice Chair Bonnie Reiss gave several warnings, threatening police intervention if there were continued disruptions. Students left the meeting room and continued to protest outside, dispersing by about 1 p.m. 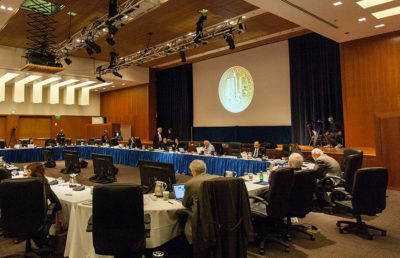 Previous years’ regents meetings involving tuition hikes have seen larger and more intensive protests, such as the 2014 fall meetings where a UCSF Conference Center door was broken amid protests over tuition hikes approved that day. Contact Sakura Cannestra and Malini Ramaiyer at [email protected].